This page just had to be called Match Reports, but basically it will give attendance figures, amounts raised and other general information. Right, this was a really good night !!!!!! We also had an extra £10 from MPC who paid to have an advertisement put on the site. Talking of advertisements, I have put another one on today for "Natural Hills"
The actual attendance figure was 33 which is one of the best so far. We are looking at alternative fund raising ideas to get people together - probably a barbecue in the summer. This will be an opportunity to get wives and kids to come along and may be themed just for the hell of it. Sadly the attendance was down to just 24 people, but it was still a good night. We raised £120 which included the raffle. This was a handmade butterfly (by my good self) who was named "Little Al" and was a one off in Alcester colours. The winner was my friend Mr Ian Parr, who is putting it on his wood shed - look out for photographic evidence on Facebook :). I notice that nobody has come forward to advertise FREE of charge on the site. It doesn't come any cheaper and I will do the artwork if necessary. It was good to see an old stalwart of the club Mr Fred Gadd last night along with everybody else. The next get together should be on either December 11th or Dec 18th. If you have a preference let me know. OK, this was what the "3 Pints Club" is all about with 37 members attending and players who had trained all drinking together. 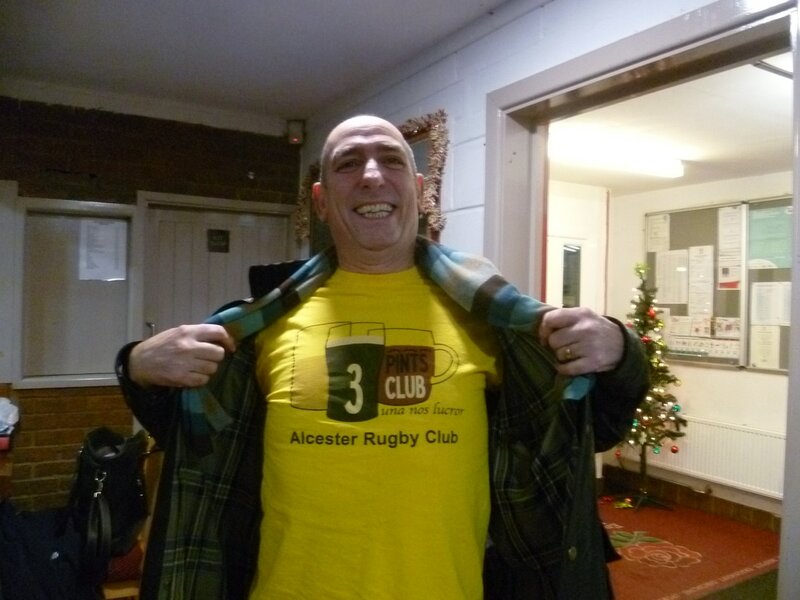 The club was busy and of course the bar, all of which helps the survival process of Alcester Rugby Club. We raised £205 including the raffle and this brings our annual total to £535 which is pretty good. We do have a lot of names on our members list who have never put in an appearance, it would be brilliant if they could get involved in 2015. As the old saying goes "THE MORE THE MERRIER" !!!!!!!!!!!!!!!!!!! The next get together will be in March, the date is yet to be determined but probably 12th or 19th - it will be on the home page shortly as always. Please check the list of members and see if there is anybody that you can contact and get them to come along. Steve Faulkner, Mick Russell, Graham Farmer, Andy Taylor and what about the elusive Al Williams ? I had hoped for a slightly better turn out for the first get together of the year, but a lot of people were unable to attend for one reason or another. Anyway, we actually had just 23 people which included the return of Tim Eagleton whose son David has passed his test and is now able to ferry him around. We actually raised £96 which isn't too shabby and most people seemed to enjoy themselves. Well sadly I was unable to attend the September get together due to illness, but must thank my friend Antonio Cortes for standing in for me. Apparently it was quite quiet but we made around £95. On the above date we had a really good turnout and it was a great night with lots of laughter and a few new faces. Between the attendance donation and the raffle we raised exactly £190 which is great. Thanks for all who attended and all those to let me know that they would not be able to attend. ​Couple of new pictures from the night below and I can see a lot of smiling going on ! Sorry I have not put anything in this section for 2016, it was quite a difficult year for me. We raised £465 with some help from our friends at Redditch Rugby Club over the year and the December meet up was a lot of fun with a couple of unexpected new faces. Gary Shaw has now moved back to the UK after many years away and hopefully we will see a lot more of him now. As I have moved to Bridlington it is not quite so easy to see people, but nothing hopefully is going to change. We will still have 3 get together's each year and the first one will be a daytime job on April 1st. Bridlington RFC are helping to raise some money with a new IPF collection box on the bar. It has only been there a couple of weeks and appears to be almost full - brilliant.